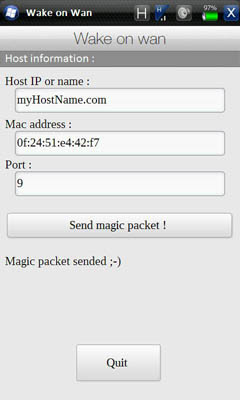 This new Windows Mobile application can wake up hosts in a network or over the Internet. Your networkcard and/or PC must support AMD's Wake-On-Lan (WOL), but most networkcards and PC's do support this nowadays. # Use Win32 Sense SDK. # Stores hostname, MAC address and port number using registry.